Due to some crap I’m having to deal with in regular life right now, I’m finding it extraordinarily hard to get motivated to climb the stairs. Well, that’s not entirely true. I can climb them. I just can’t find it in me to go very fast right now. So today was yet another slog up the Wells Fargo building. I was hoping I could do three at a steady pace, and then a fourth just to make it to the top. 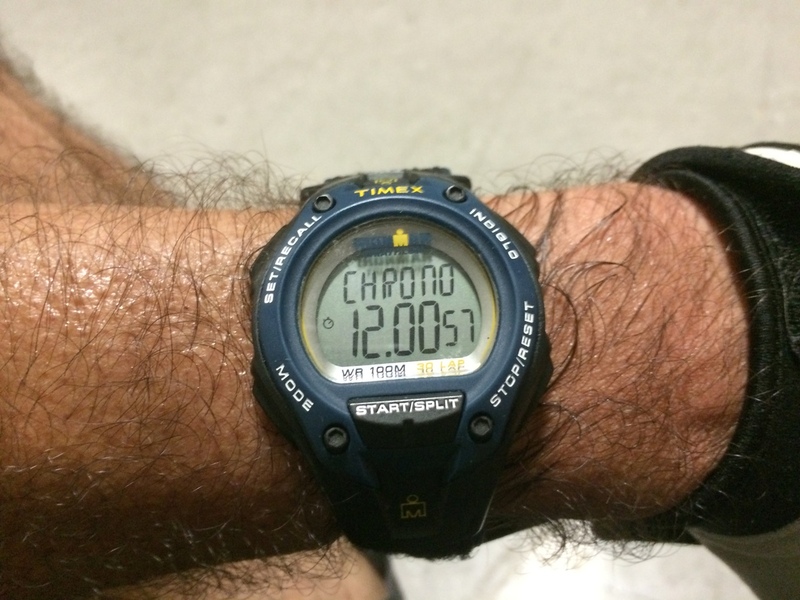 But as it turned out, I was only able to do two at my target pace, and then it kind of fell of a cliff. And yes, the fourth time was a slog, and I didn’t even bother to time it. Today’s bike club ride is the latest installment checking up on the progress of the Metro Gold Line extension out to Azusa. We’ve been going out to see this about every few months for the last two years, and it’s nearly finished. The last time we did this tour was in January, and there’s been a lot of progress since then. Starting out, we rode Colorado across Arcadia to get the the nearly-finished Arcadia station. In fact, it looks finished. The monitors were all turned on, and it looked like it was ready for a train to pull in at any time. 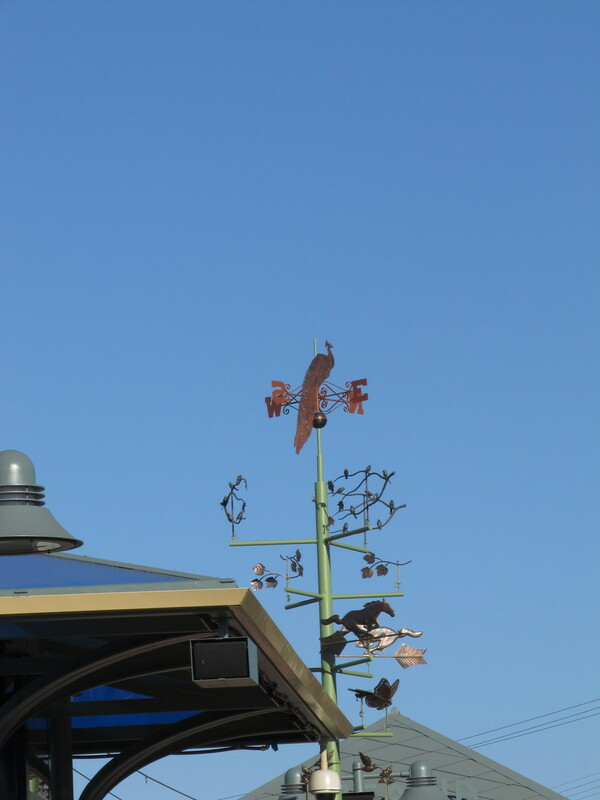 And of course the art for the station includes a peacock. 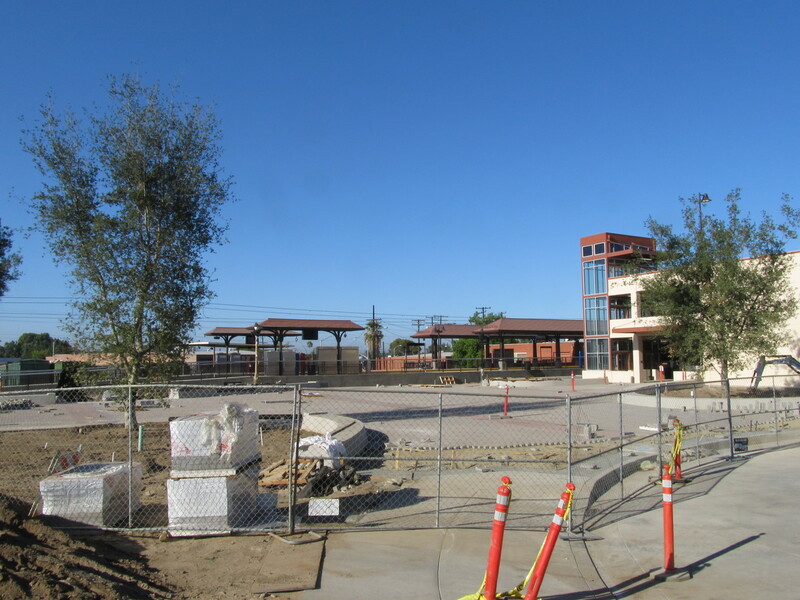 The Monrovia station looks nearly finished, but it is still fenced off, and there are still a lot of paving stones to be placed. The parking structure next to it looks done, though. We also stopped off to have a look at the operations center. Carla and I went there for the dedication and open house that Metro held back in May. 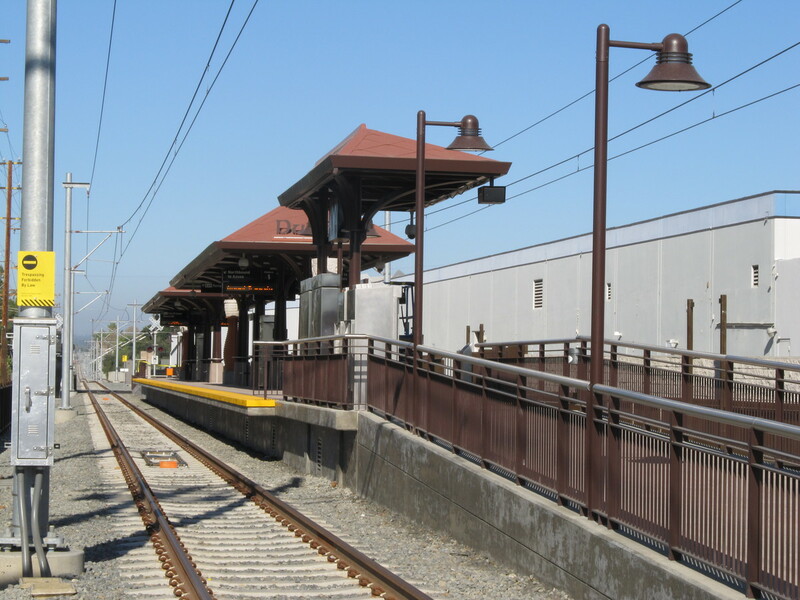 Continuing east, we stopped at the Duarte station. It also looks like it’s ready for a train to pull in. In fact, I did see a train there a few weeks ago when I rode out there for the dedication of the station. 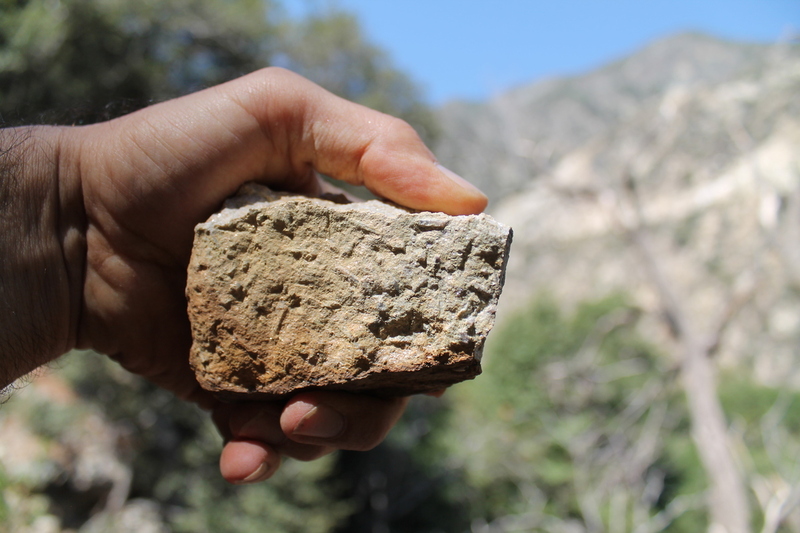 Heading up the San Gabriel River bike trail, we turned off at the Azusa Rockery. 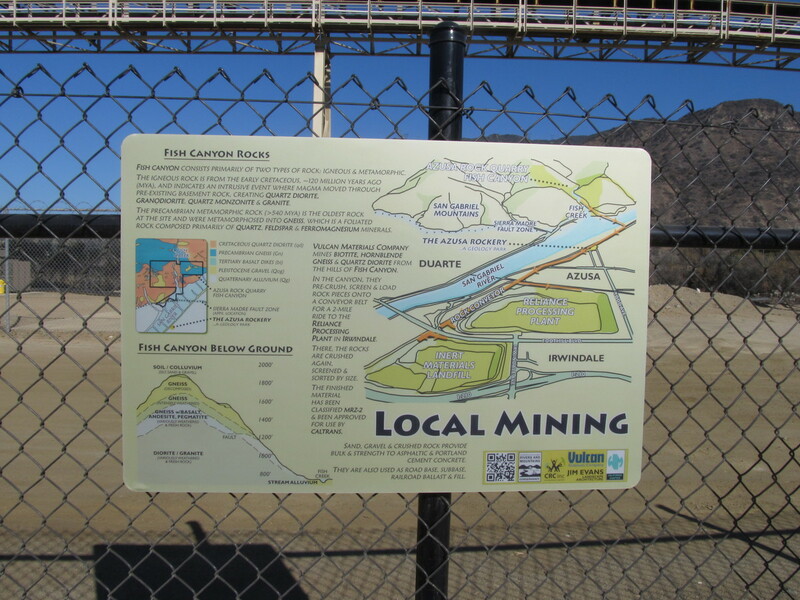 We took a few minutes to look at the signs, and we finally found out just what it is that they’re mining there. 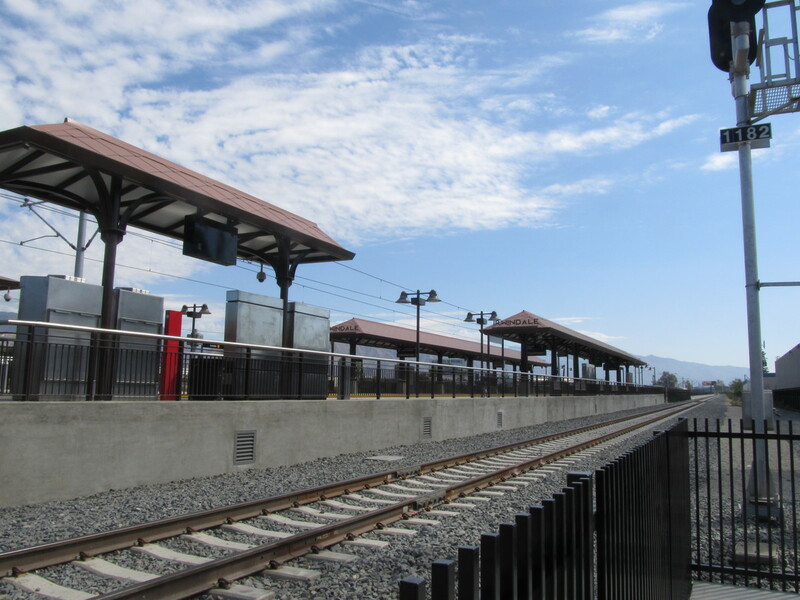 Then we continued on to the Azusa downtown station. 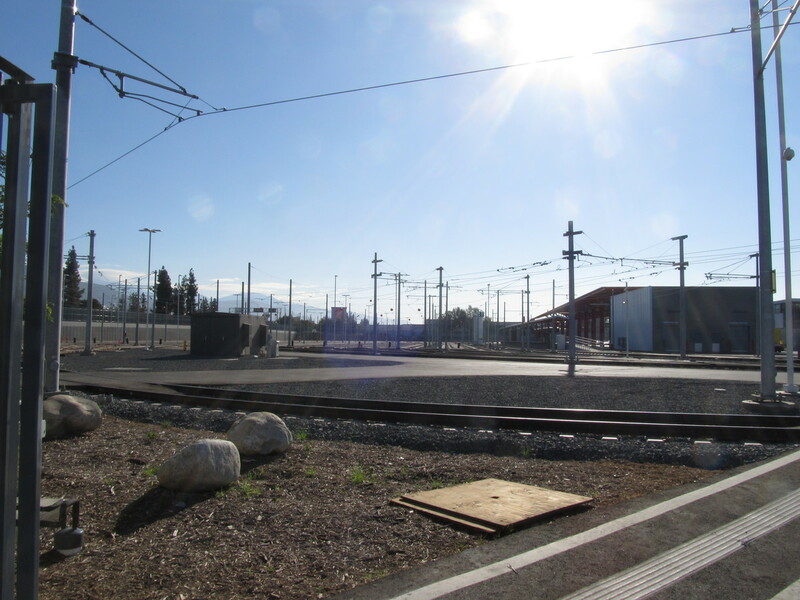 That was where Metro held the ‘Golden Spike‘ ceremony last year. It’s also where Carla and I saw how they weld the rails together with thermite. And while we were there, we met Oreo. 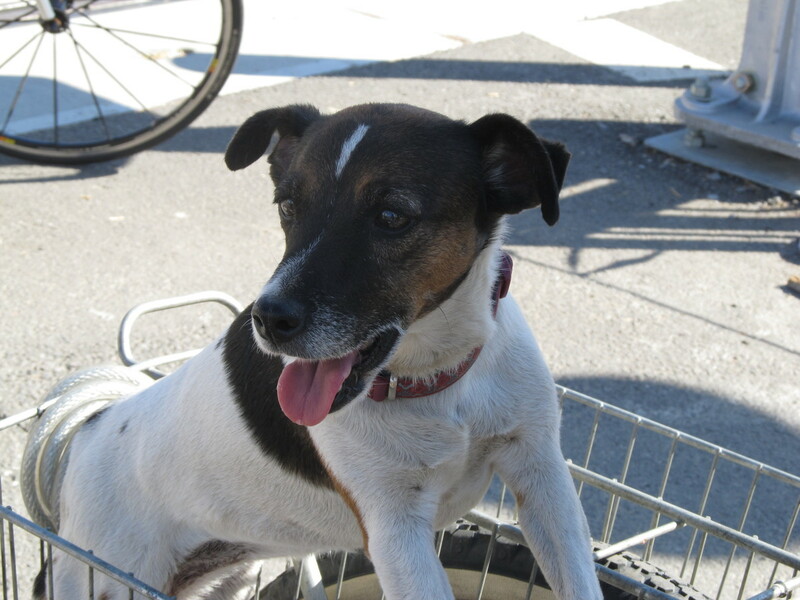 She has a piece of cardboard to stand on, and she’s happy to ride around in the bike basket. 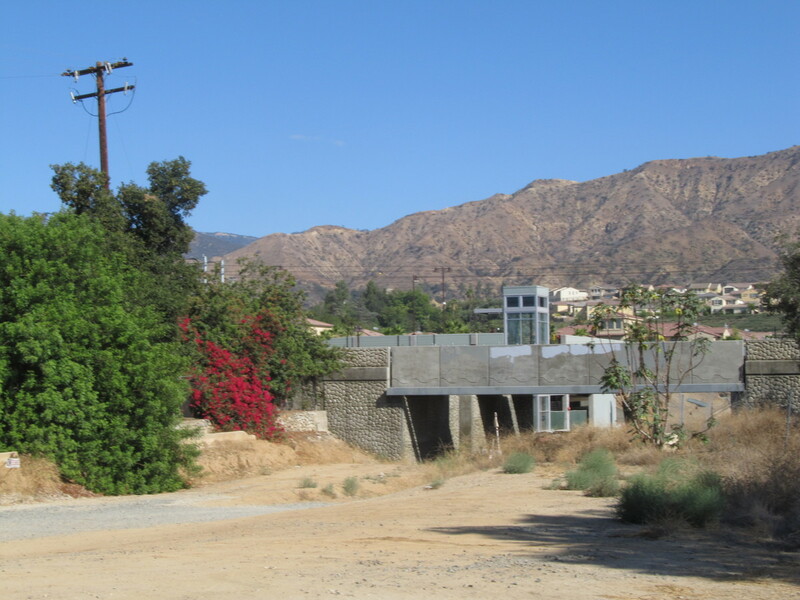 At the end of the line, we saw the Azusa APU/Citrus College station. That one looks the least finished of all the new stations. The station itself looks pretty finished, but the access to it is not done yet. It looks like there is going to be a street going through the underpass under the tracks, and that will be the access to the station, but it’s still a bit unclear if that will be a real street, or just a walkway of some sort. 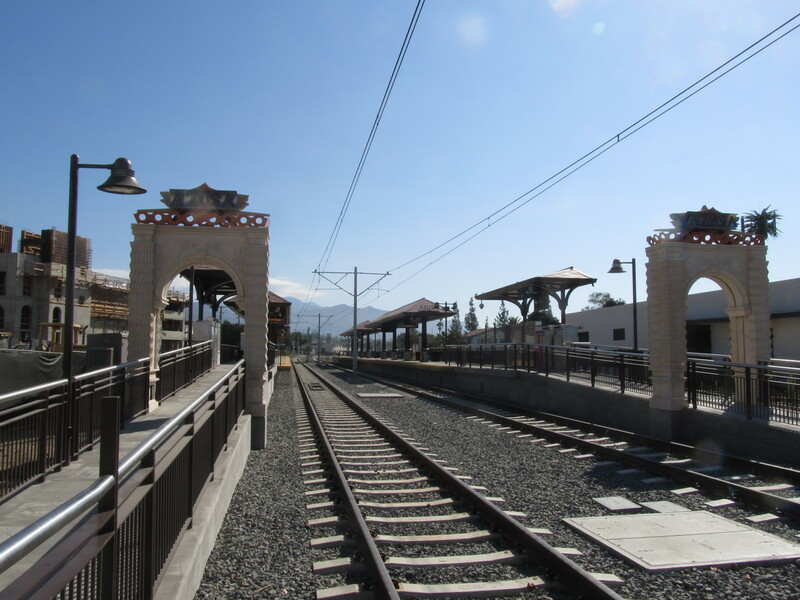 We turned south in Glendora, and we headed back on Gladstone St. We took a side trip to see the Irwindale station. It looks pretty much done. It’s a far cry from how it looked the first time we did this tour. Coming back, we rode to Monrovia and Merengue. 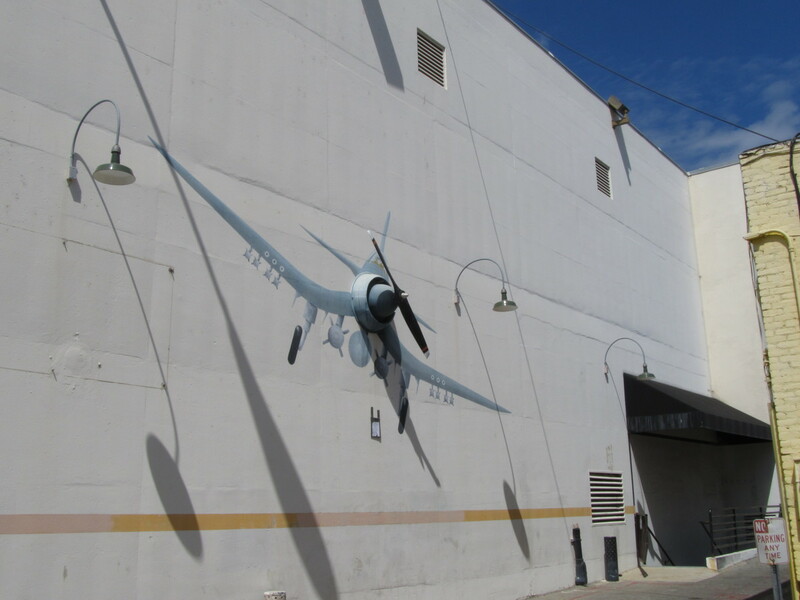 Leaving there, we took the alley, where we saw the airplane mural on the wall of a building there. I guess there was some sort of vent built into the wall, and someone decided to put a propeller on it and then paint an airplane on the wall around it. It was a good little bit of street art. I missed going to the stairs on Tuesday, since it was the day I had to turn in my brownies for the L.A. County Fair baking contest. So now it’s Thursday, and time to climb the building some more. This time, I wanted to try something a little different. 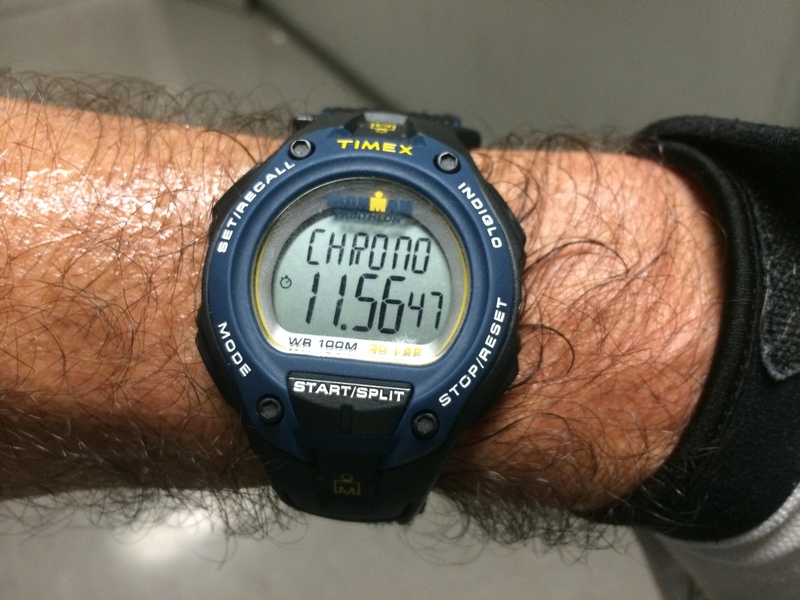 I was curious to see if I could maintain five floors per minute up the building. 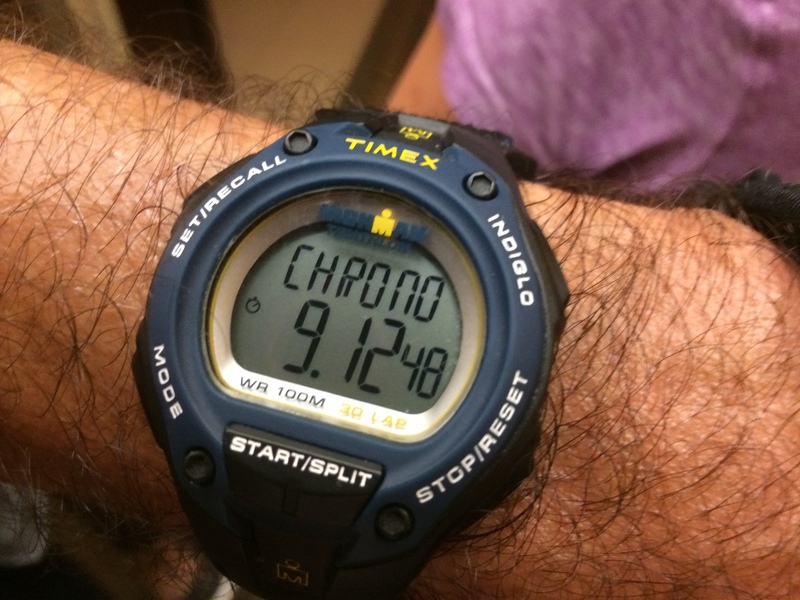 That used to be my ‘loafing’ pace, but these days, it’s about as fast as I can go for any distance. 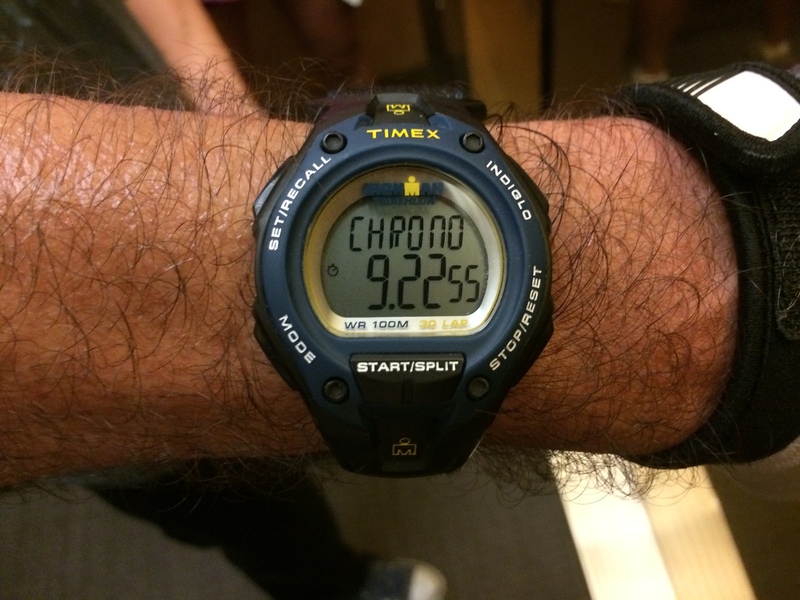 So I was curious to see if I could do it up the 54 floors at the Wells Fargo building. And as it turned out, I was able to do that just fine. 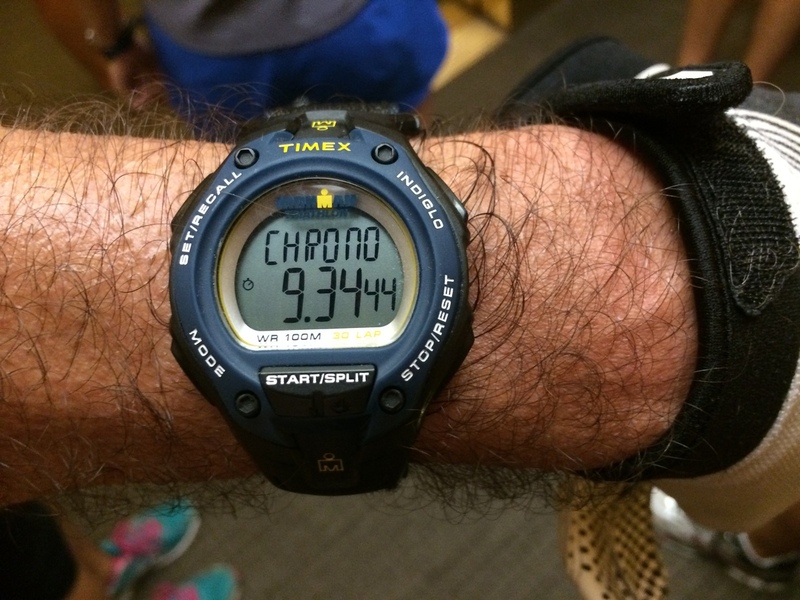 But I didn’t think I could do that pace for the second time up. 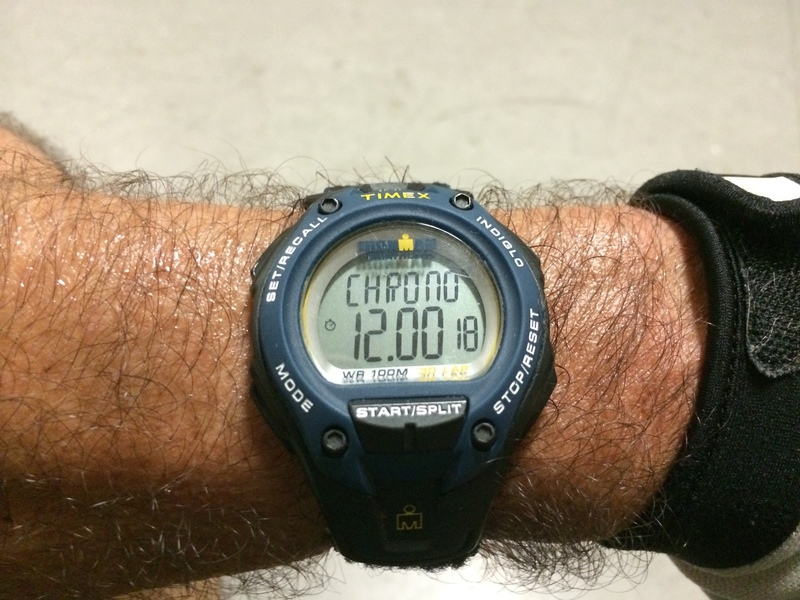 So I slowed down a bit and aimed for 12 minutes on the second climb. And I was able to do that. But the third and fourth times up the building were grim. I didn’t bother timing them, and I just sort of slogged up the stairs both times. Still, it was a good outing. 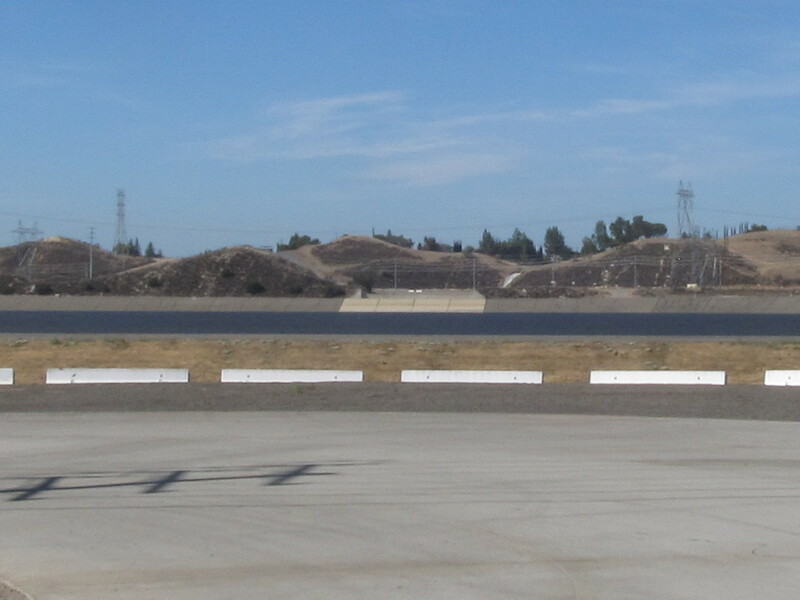 A few weeks ago, I’d read about the city had put 96,000,000 black ’shade balls’ on top of the big reservoir in Sylmar. 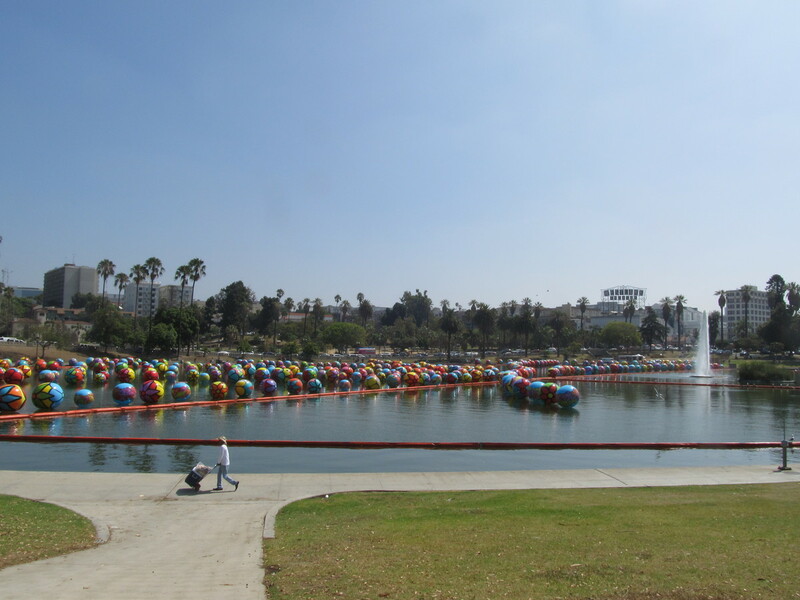 Since we went to see the art balls in MacArthur Park last week, I thought it might make a good companion piece to see these more utilitarian balls-floating-on-water this week. The route was straightforward. 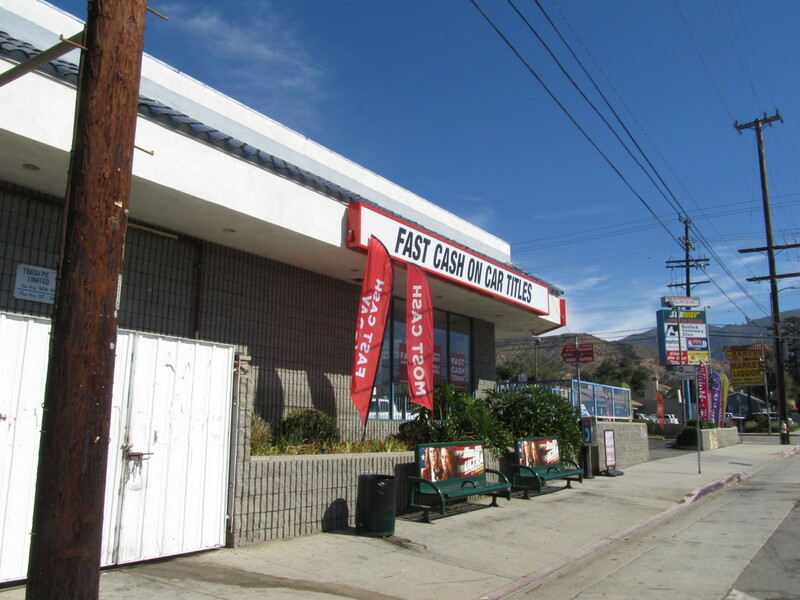 Across Eagle Rock and Glendale, and then all the way up Glenoaks to Sylmar. 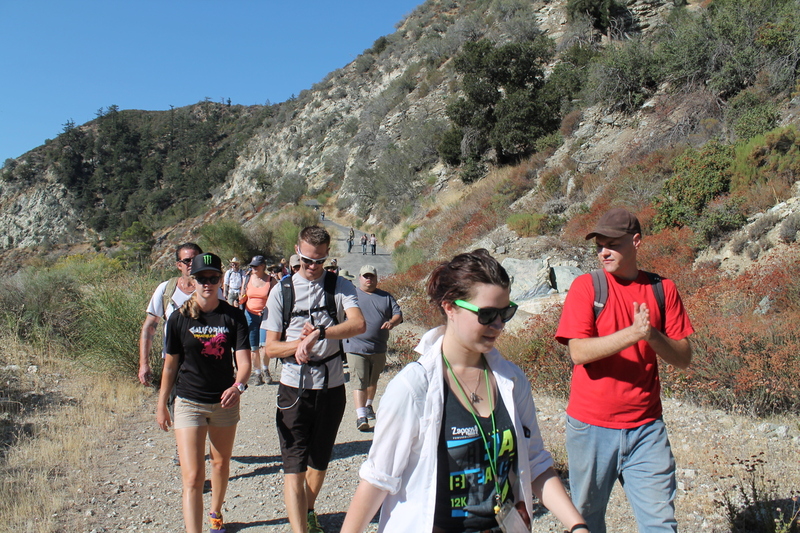 We did most of this route last summer, when we went on a tour of sights from the 1971 San Fernando Earthquake. Since we were there, we stopped briefly to see the fault scarp next to the McDonald’s in San Fernando. 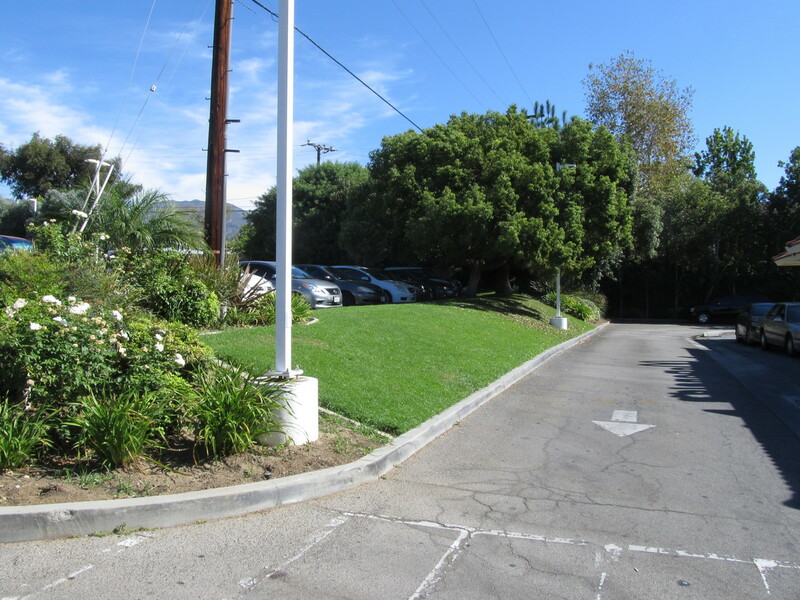 Then we continued north on Glenoaks, almost all the way to its end. A quick left on Roxford St brought us under the 5 freeway, and right to the reservoir. And from there, we could see the water, completely covered by black plastic balls floating on the surface. 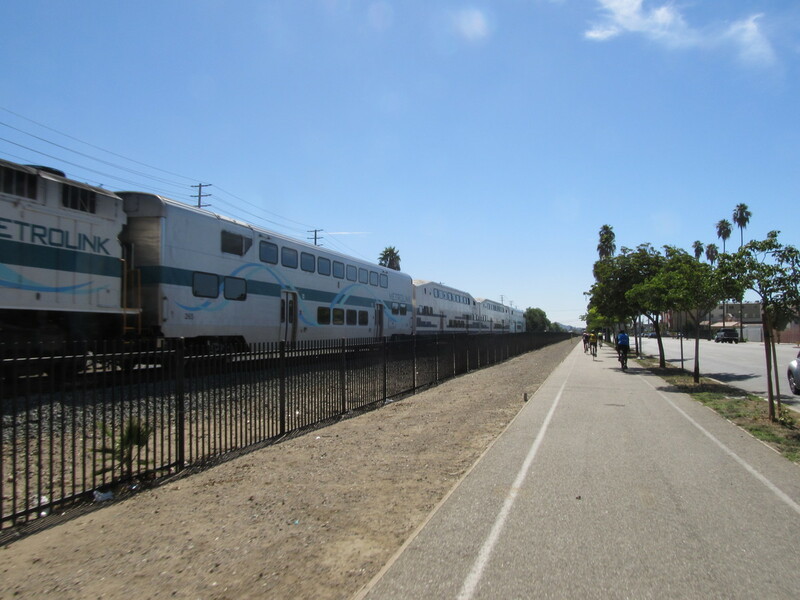 A few months ago, I had occasion to take the Metrolink train back from Santa Clarita one day. 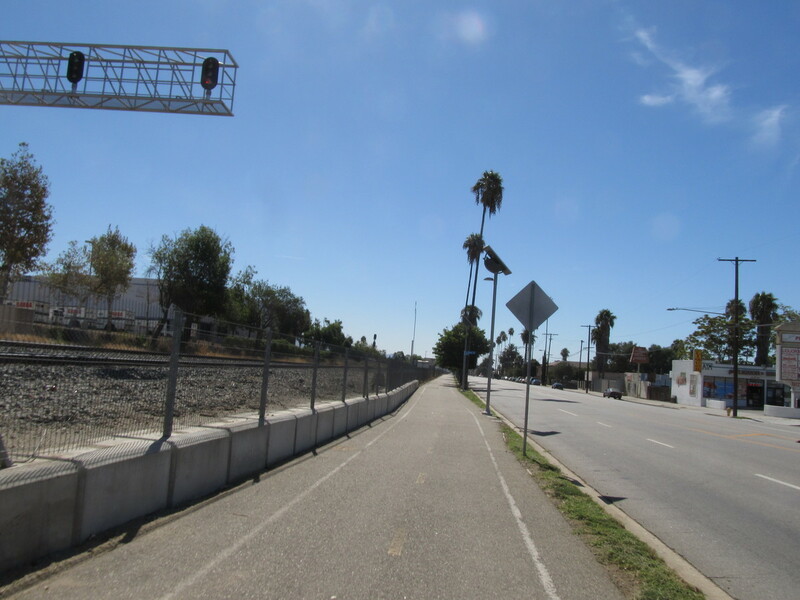 Along the way, I’d noticed that there is a dedicated bike path that runs between San Fernando Road and the Metrolink tracks. So we tried that out today. 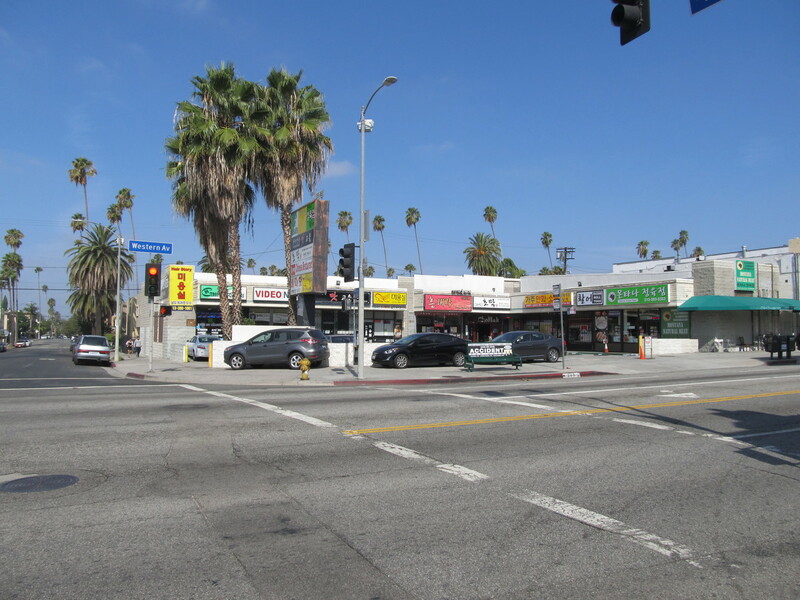 The north end of it begins at Roxford, and we rode it for several miles, all the way to Van Nuys Blvd. It was a pretty nice path, although it had some discontinuities at some intersections where it moved from one side of the railroad tracks to the other. They kind of need to sort that out to mark it better and make it a little easier to get across the streets at those places. It was hot, so we stopped to get some cold water along the way. That helped a bit. And then it was time for the ride up La Tuna Canyon. Five miles uphill, and as much fun as it sounds like. With the heat and the distance we’d traveled, we were kind of dragging a big by the time we got to the top. 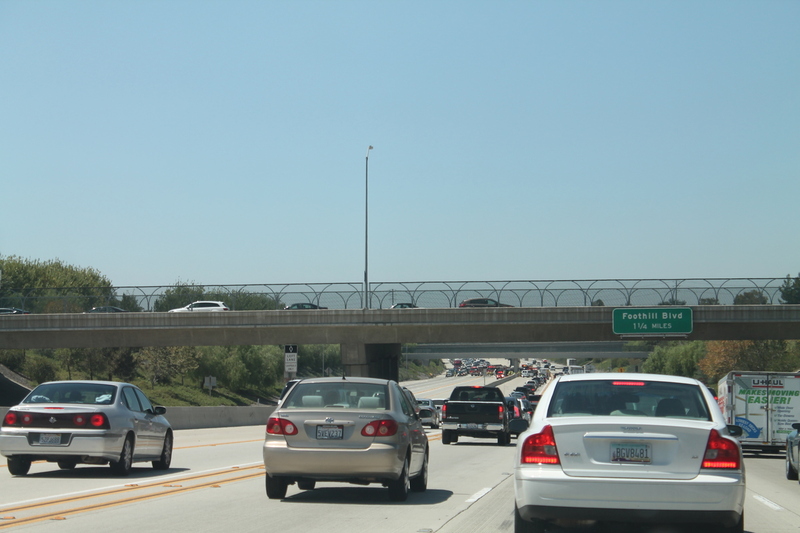 But from there, it’s almost entirely downhill all the way back to Pasadena. So all told, it was a nice ride. Today was yet another little adventure with Atlas Obscura. 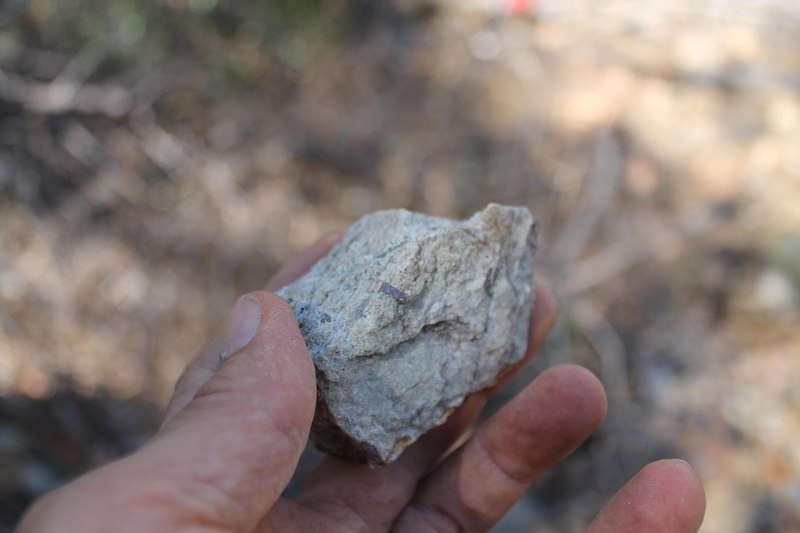 Today it was Rock Hunt: Rubies. 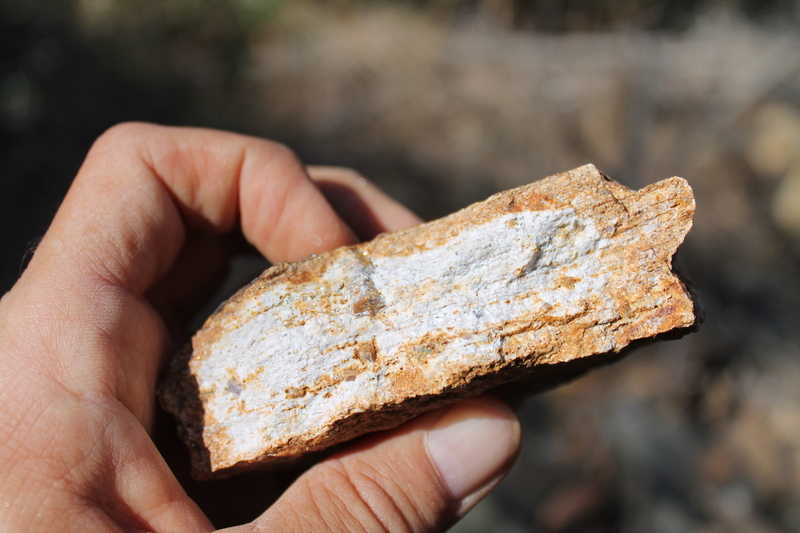 This was a short hike to a rock slide where the many of the rocks have corundum crystals embedded in them. The night before, the organizer emailed us the location to meet. It was a bare set of lat/lon coordinates, which turned out to mark the location of a turnout off Mt. Baldy Road above Claremont. I put them into Waze, and it worked out how to get there. 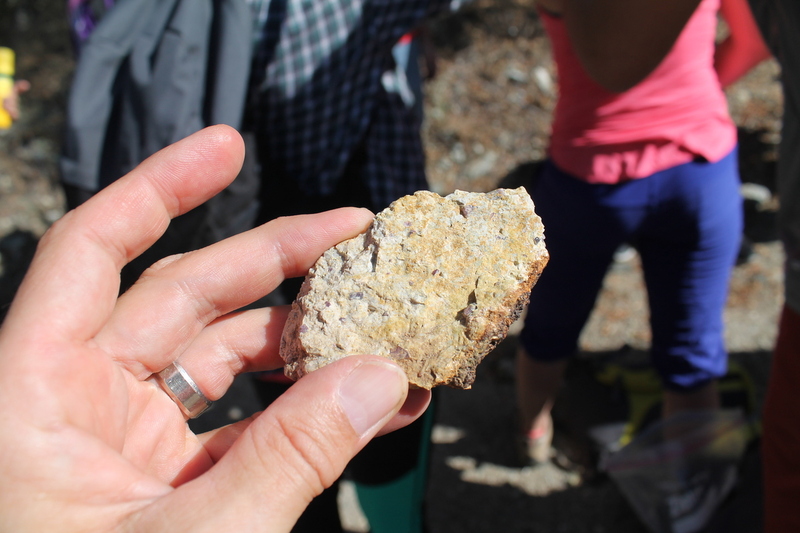 At the start, our guide passed around some rocks for us to look at so we would know what we were looking for. Then we headed out. We walked a short distance down the road to a small road that branched off down into a canyon. At the bottom, we took a trail that led us down to the river at the bottom of the canyon. Since we’re in our fourth year of drought here, the river was very small. We were even a bit surprised to see running water in it at all. 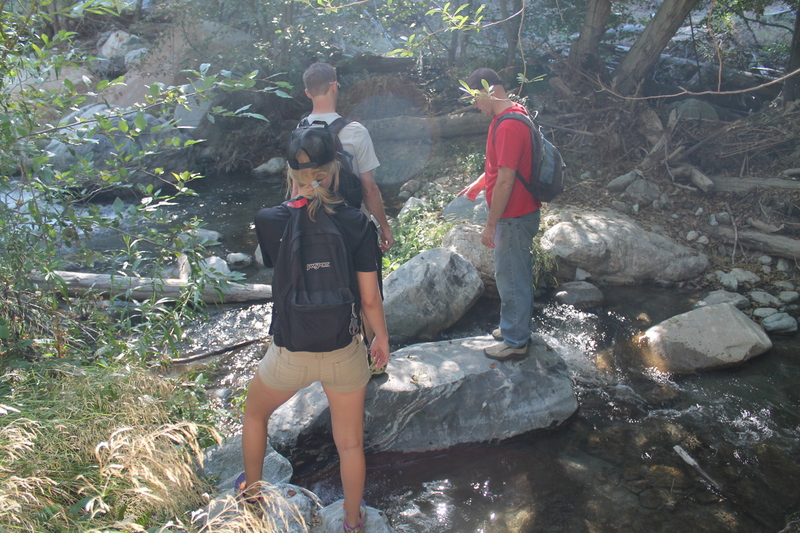 We hopped across on some rocks and kept walking. In a bit less than a mile, we got to the hillside with the rockslide. 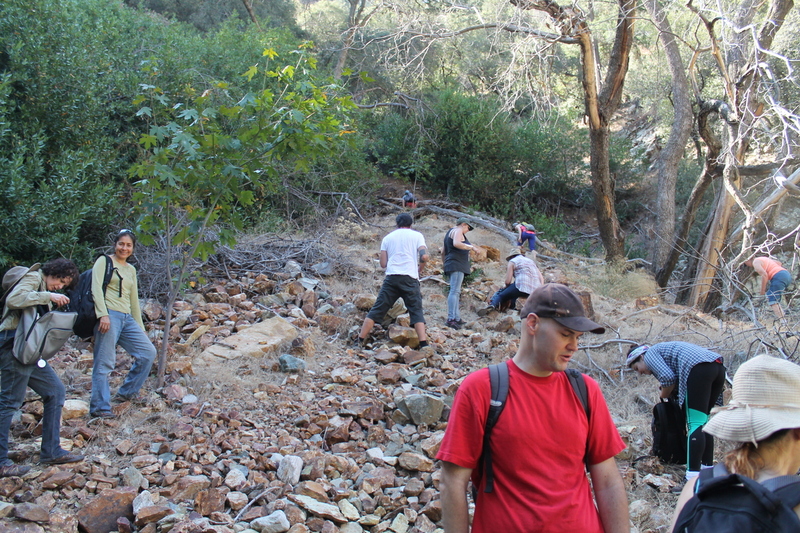 We all just sort of picked a spot and started digging and breaking rocks. In about ten minutes or so, I found my first ruby crystals. Once I’d found the first one, it was pretty easy to find more. We stayed there for about two hours, and in the end, I had about ten pounds of rocks collected. 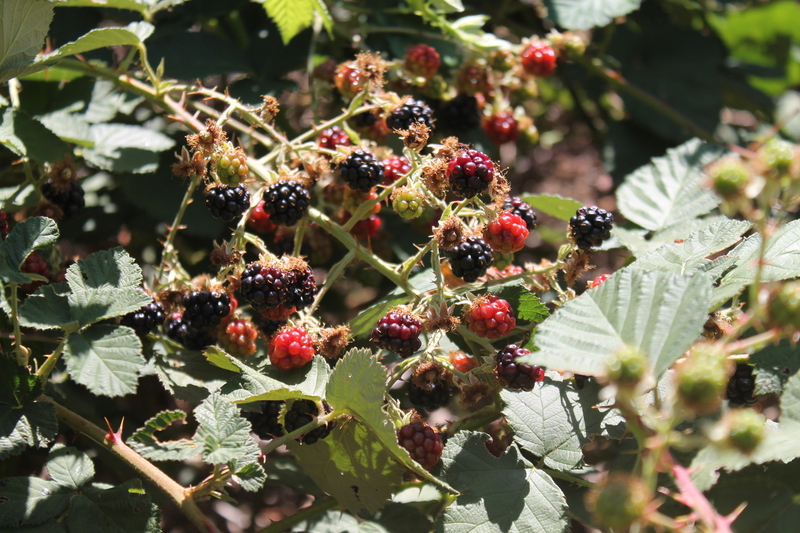 On the way back, we stopped at the blackberry patch. Looking closely, we saw quite a few blackberries on the bushes. 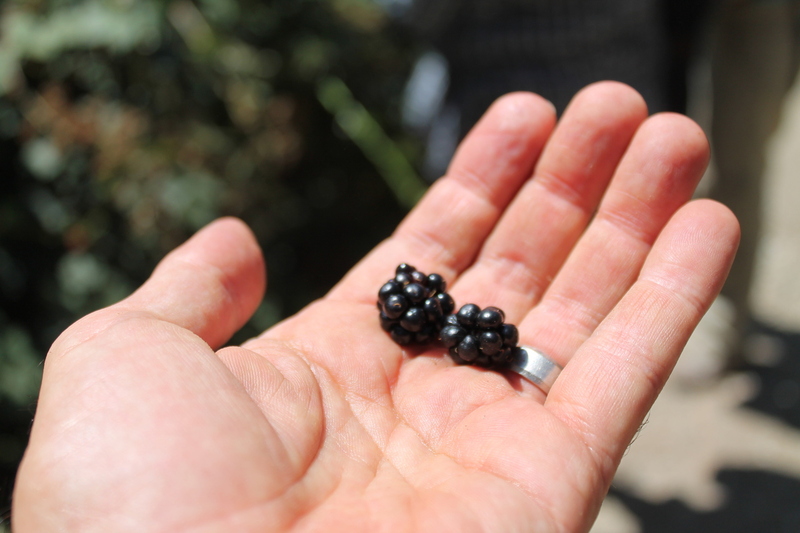 Most of them were just out of arm’s reach, but there were some we could reach, and they were very tasty. This was an interesting and entertaining little adventure. The one final bit of drama was on the freeway going home. Traffic stopped suddenly, and up ahead, I could see there had been a spectacular truck accident, and the CHP had temporarily completely blocked traffic in both directions. Most of the wreck was on the other side, so our side was only stopped briefly, but it was still dramatic-looking. Today is August 27th. It’s a holiday in Texas. That’s because Lyndon Baines Johnson was born on this day. 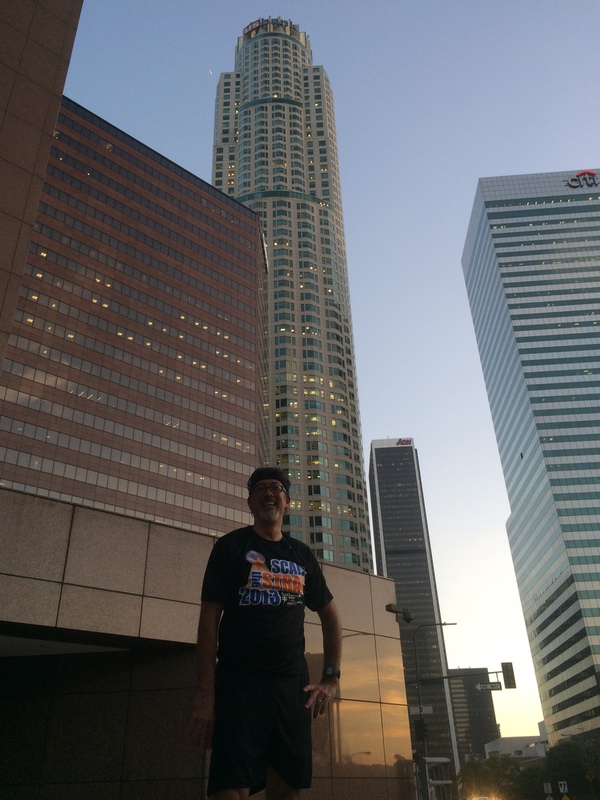 But here in Los Angeles, it’s just Thursday, and time to go downtown and climb the Wells Fargo building stairs again. They told us that there was another elevator problem, so we could only go to 44 tonight. But that meant that I could get in five climbs instead of four, and that works out to be basically the same total amount of climbing. 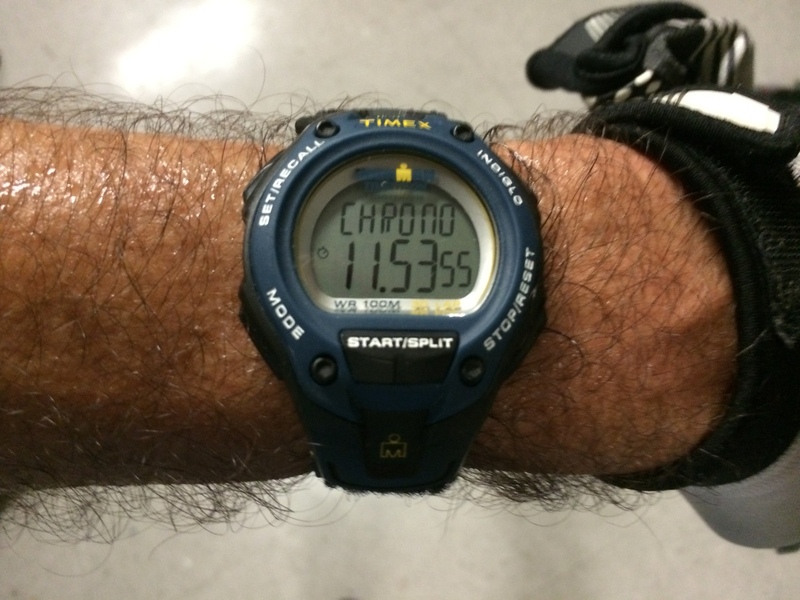 My goal for tonight was to do four climbs up to 44 in 9:33 or faster. 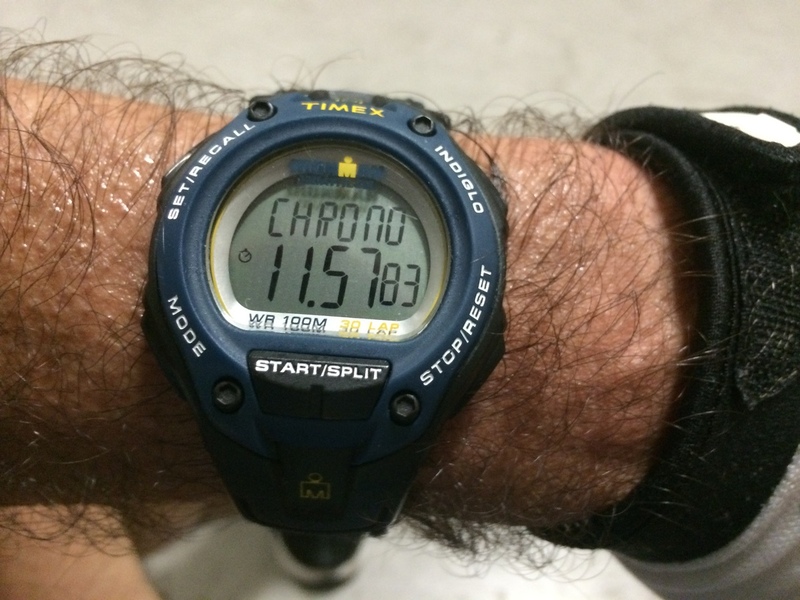 I was aiming for a target pace that would get me there in about 9:30. The first two times up, I was holding back a lot, and I still got up faster than my target. The third time I was just cruising, not holding back, but not pushing, either. 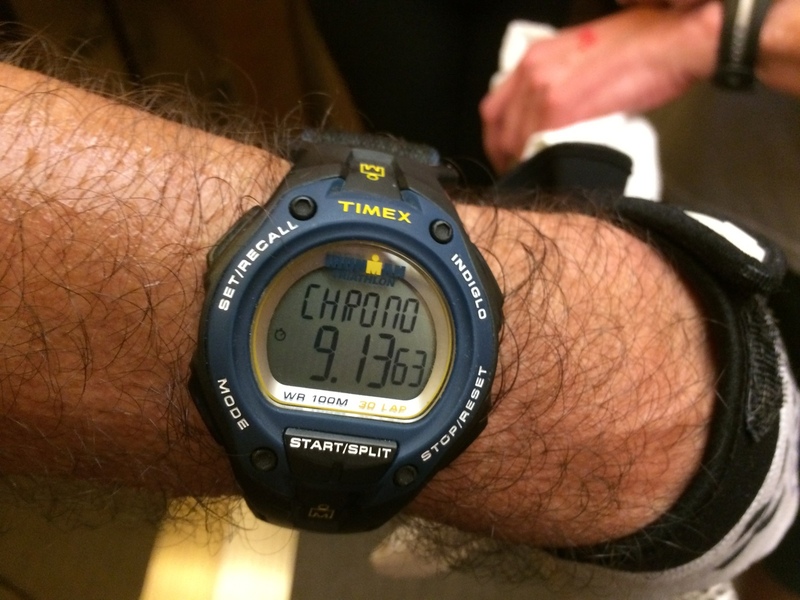 And the fourth time, I had a push a little to maintain my target pace. But I came out on 44 right on time, so I guess I made my goal. My reward for making the goal was to go up a fifth time, but un-timed and taking it easy. George was there, so we walked up together, talking and stopping at the fans at 11, 27, and 41. It was a nice evening on the stairs. Tonight was yet another session on the Wells Fargo staircase, and tonight I managed to make three climbs up to 55, all within one second of each other. That’s a big step, since I haven’t been able to do anything like that in a long time. The first time, I was holding back quite a bit. 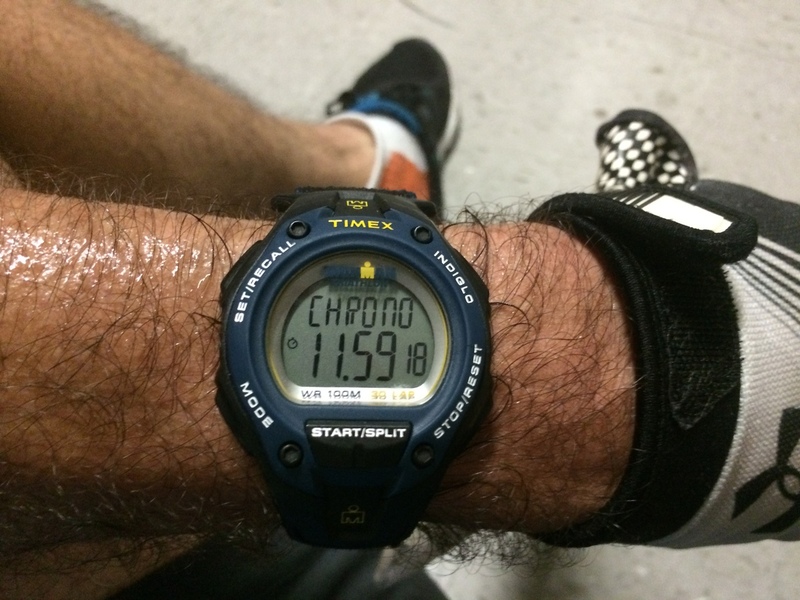 I made a conscious effort to slow down, and I came out on top in 12 minutes even. 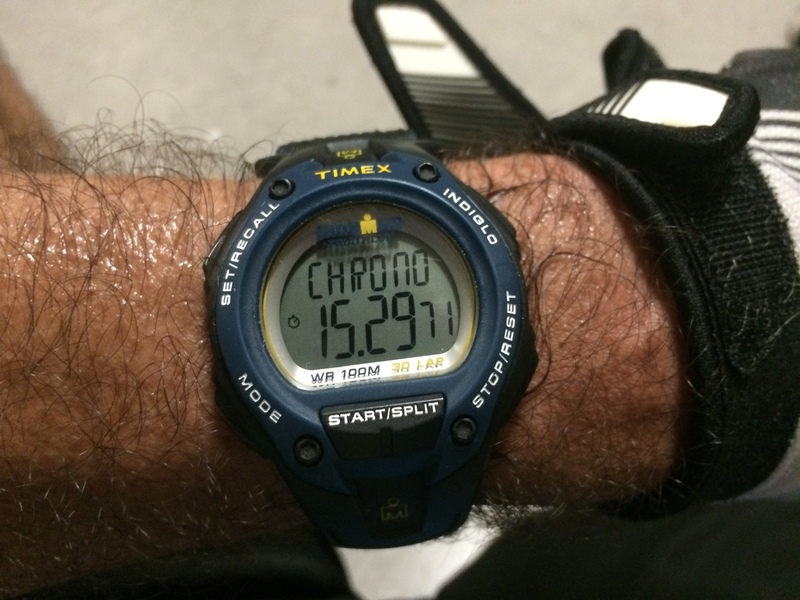 The second time, I was still holding back a little, but maintaining the same pace. And I came out on top in 12:01. 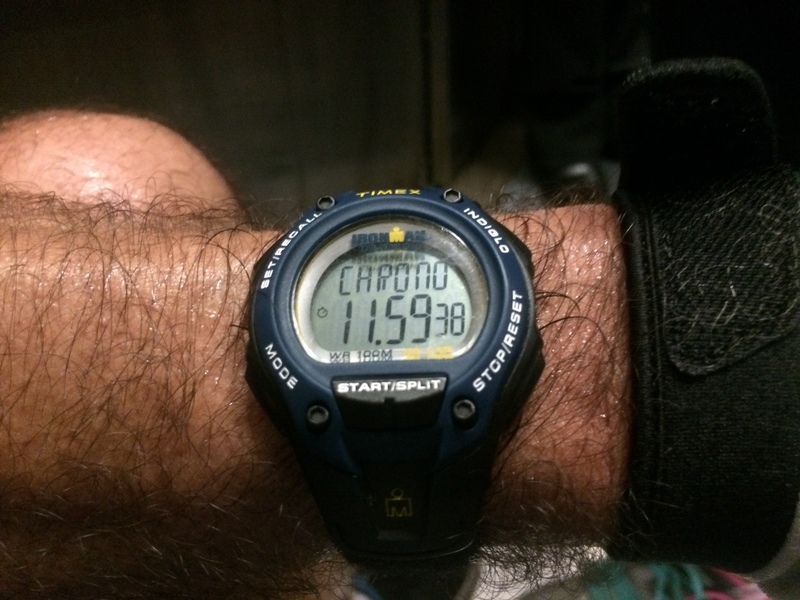 And the third time, I had to push just a little bit the last five floors or so, but I made it up in 12:01 again. This is the most consistent pace I’ve been able to do over , multiple climbs since 2013, so that’s a Good Thing. Any my reward for making the three climbs at a steady pace was to do the fourth, untimed, and stopping to cool off at the fans on 11, 27, and 41. I just took it easy the fourth time, and made it up in about 15 minutes or so. Good times. 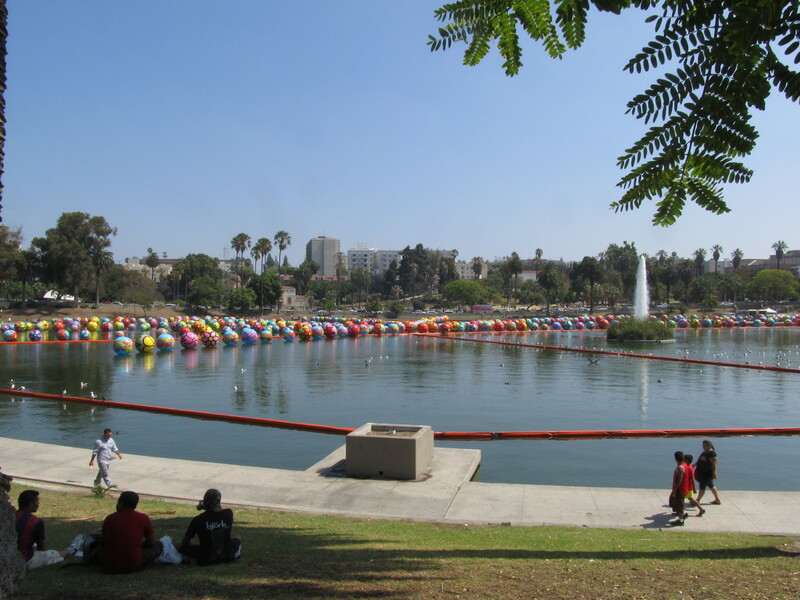 A few months ago, I read about how an artist was planning on having some 3,000 plastic spheres painted with flowers, fish, birds, and so forth, and then was going to float them all on the lake in MacArthur Park. I made a note that we should go see this when it was done, and this was the weekend. This is our first art tour bike ride since we went to see “Urban Light” back in May. 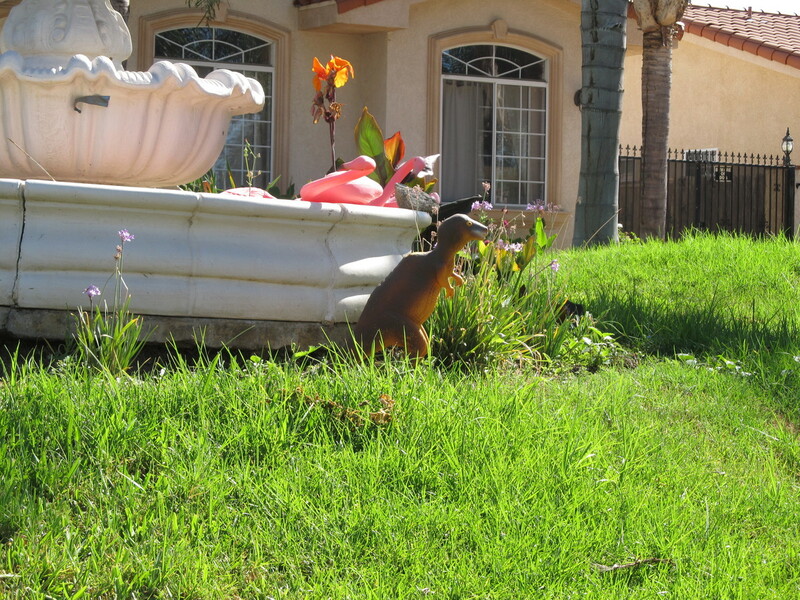 We rode down Huntington Drive into downtown L.A., and then down Spring St through downtown, and then Flower down to Adams, near USC. On the way out on Adams, there is a place with some sharp humps in the pavement, and Carla’s pedal hit the peak of one of them. 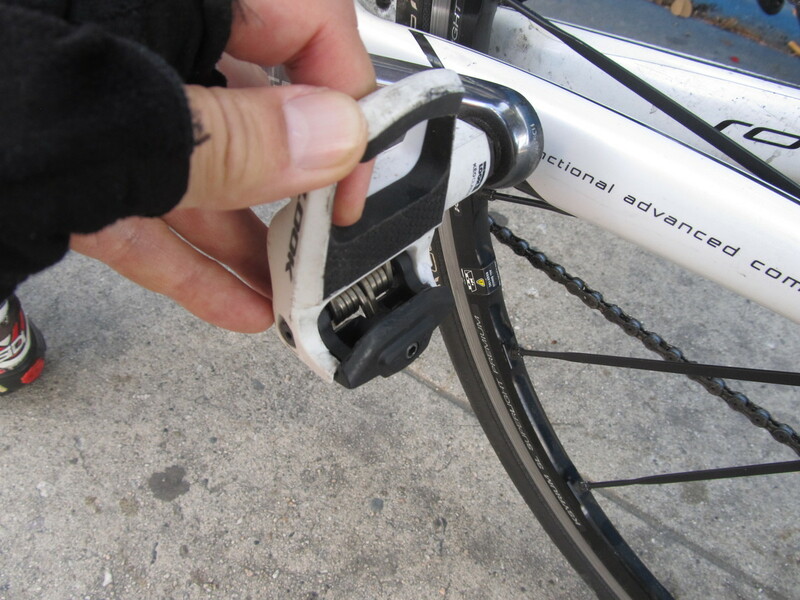 This knocked her foot out of the pedal, and it snapped off one of the little stops that hold the spring-loaded back of the pedal. We were able to lever it back into place well enough to continue the ride, but that was today’s installment of the long-running series, “I’ve never seen one of these break before“. We stopped for bagels at Noah’s in Larchmont. After that, we headed back toward downtown, taking 7th St in, since it goes right by the park. When we got to the park, we stopped off to have a look at the balls floating on the lake. 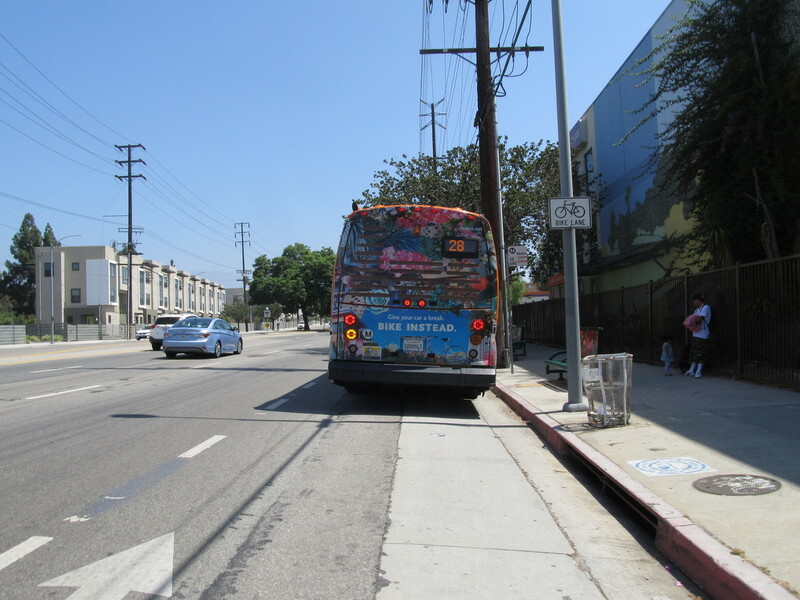 The route home went through Echo Park and Silverlake, and then home by way of York Blvd and South Pasadena. It was kind of hot at the end, but a pleasant ride. 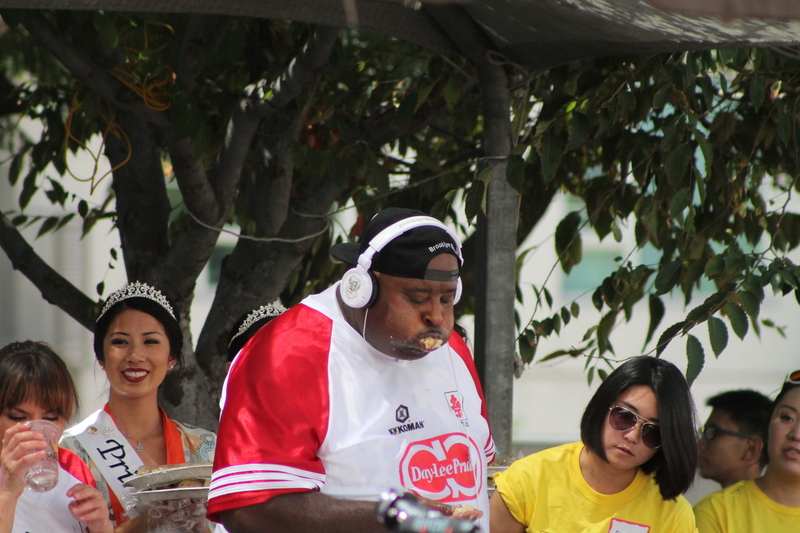 Today was the gyoza eating contest, which is one of the events in Little Tokyo for Nisei Week. We’ve been to see it in 2011 and 2012, and it was both hilarious and horrifying. That makes it a “must-see” in my book. So we took the train down to Little Tokyo to go see it. 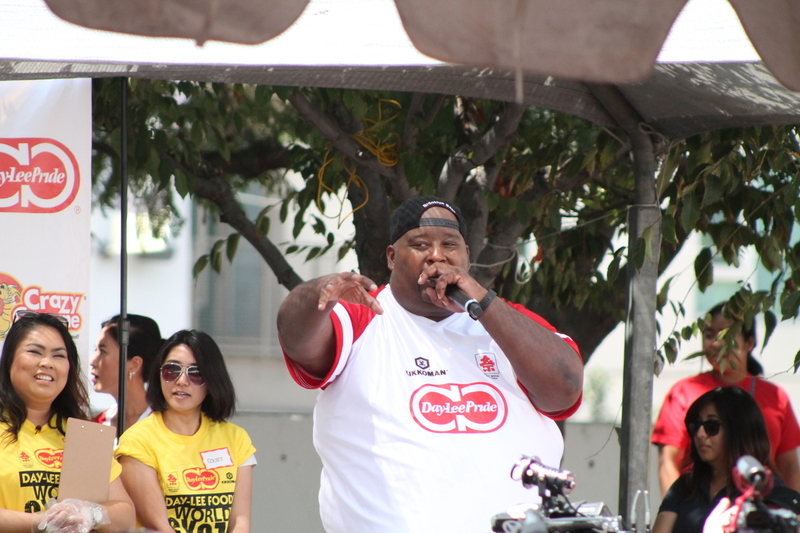 As always, the announcer from the IFOCE was great. He knew all the statistics, the rankings of the eaters, what contests they’d each won. And he introduced each one with enthusiasm and stomach-turning stories about how much they could eat. 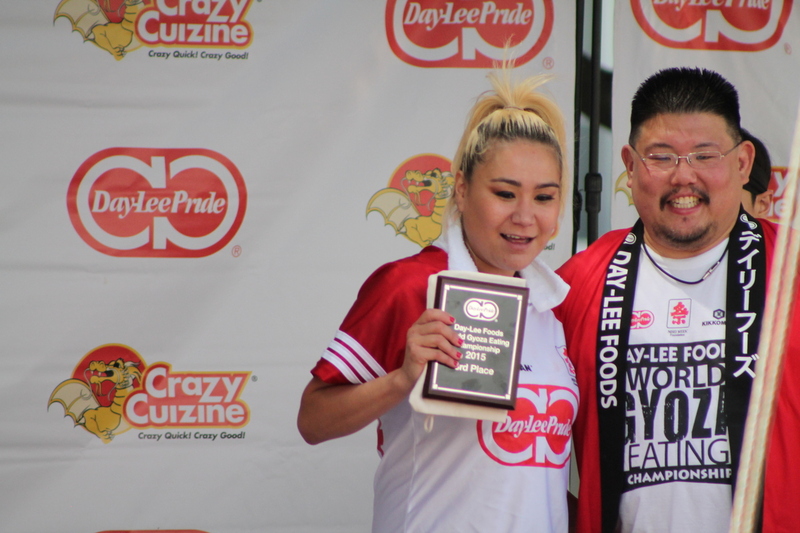 Each eater who had competed in this event before had a number on the back of their shirt signifying how many gyoza they had eaten before. 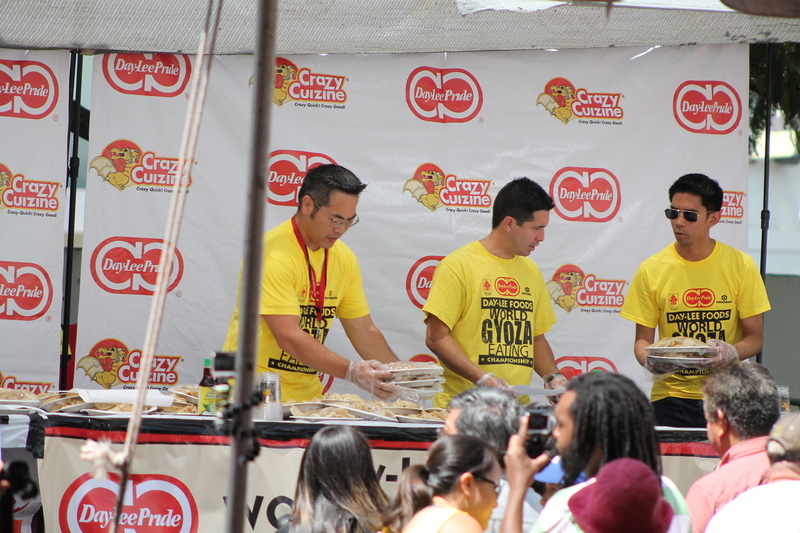 Joey Chestnut was there, and he holds the record with 384 gyoza in ten minutes. At the same time, the tables were prepared with stacks of plates, each plate carrying 25 gyoza. 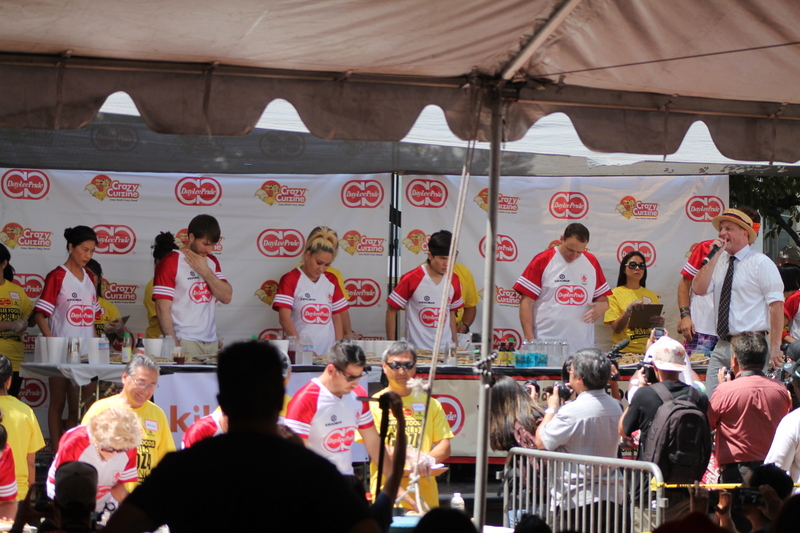 The announcer had the audience count down from ten, and they were off and eating. It’s really amazing to watch. The intense concentration, the heads bobbing up and down, swigs of water to wash it down, and occasionally jumps and shimmies to try and pack the food down in the stomach. The contest was ten minutes. And nobody stopped eating. They were stuffing their mouths as fast as they could swallow, and nobody suffered the dreaded “Reversal of Fortune“. 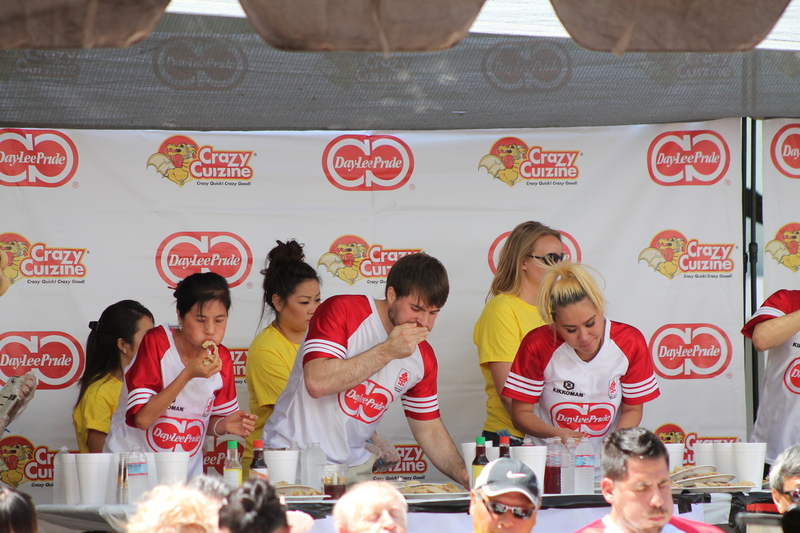 When the countdown to the finish came, they all stuffed their cheeks like chipmunks, since any gyoza that are already in their mouth at the finish count as long as they swallow them. 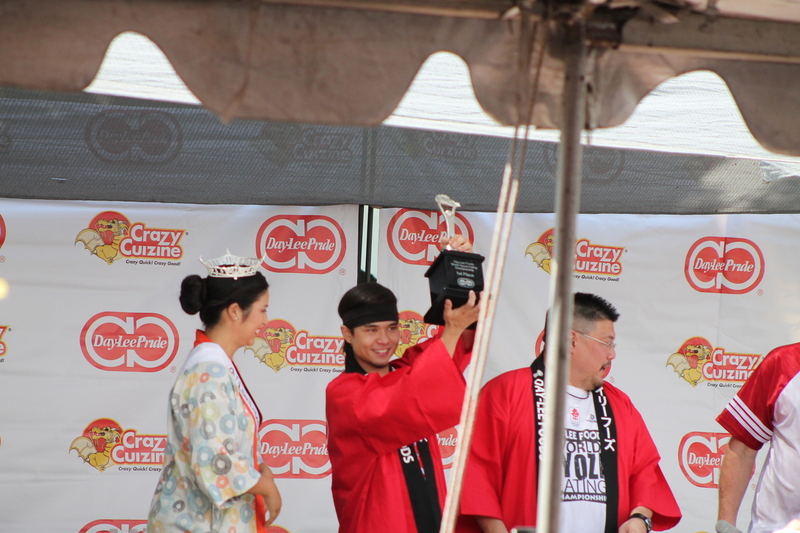 In the end, they tallied up the results, and Matt ‘Megatoad’ Stonie won with 343 gyoza. He didn’t set a new record, but it was enough to win. 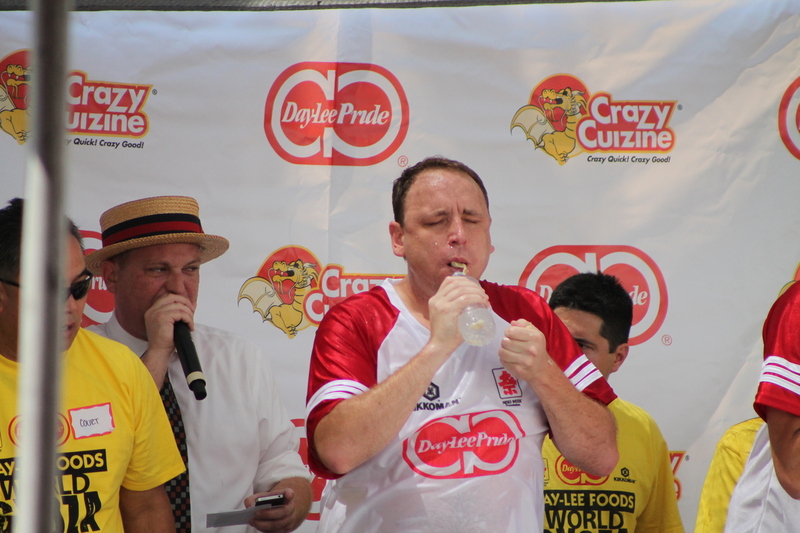 Joey Chestnut came in second with 339. Miki Sudo came in 3rd with 178. Full results are on the Major League Eating web site. 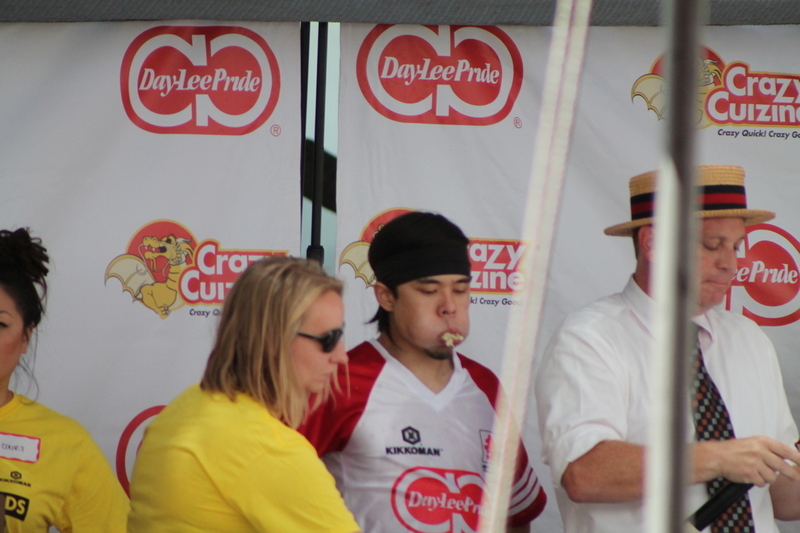 As I said, watching this contest is both hilarious and horrifying. I recommend it highly. 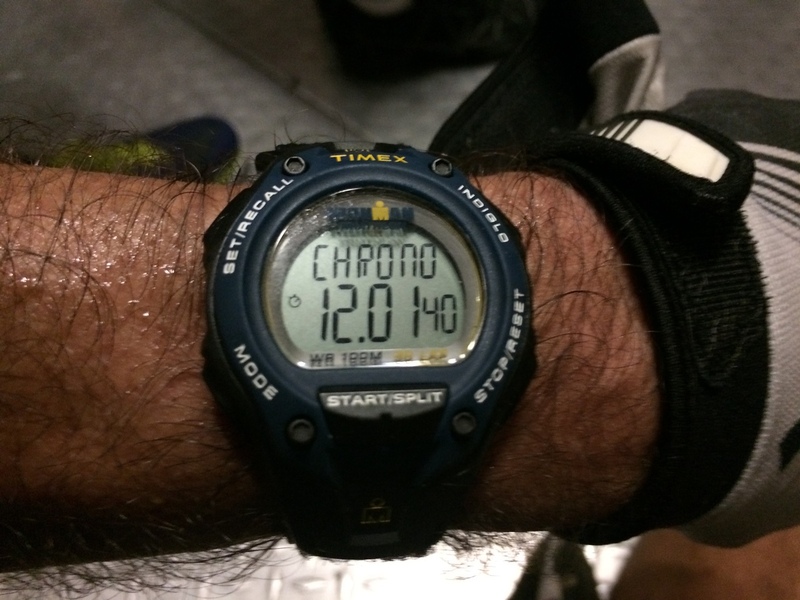 Tonight’s stair session was another attempt at maintaining a consistent pace over multiple climbs. And this time, the magic worked better than it did on Tuesday. Still not as good as it was two years ago, but better than I’ve done in a while. 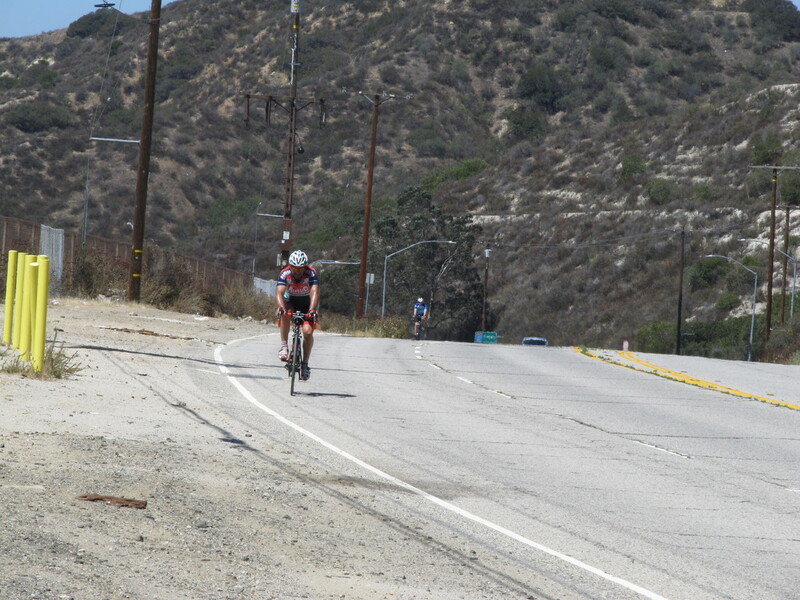 On the first climb, I held back a lot. 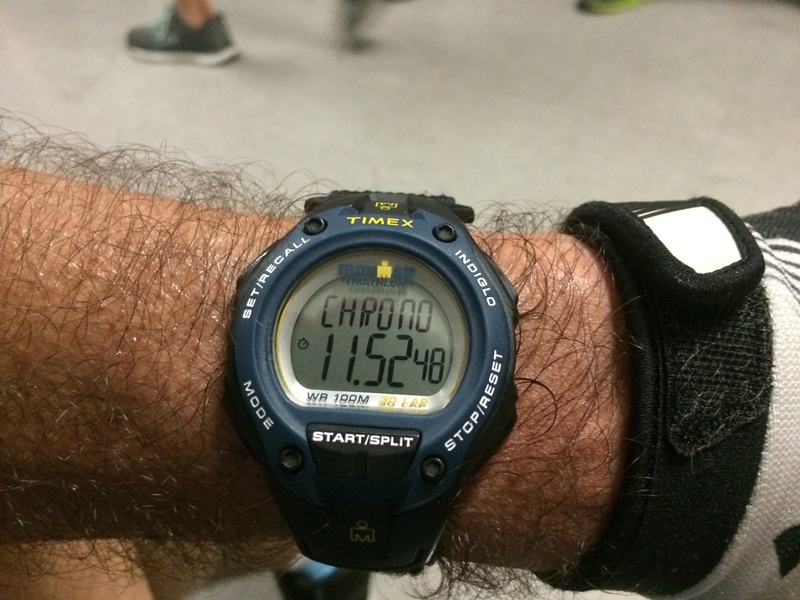 I was aiming to get to the top right about 12 minutes, and 11:56 was nicely close. The second time up, I had to hold back a little bit, and I made the top in 11:59. The third time, I was feeling it. 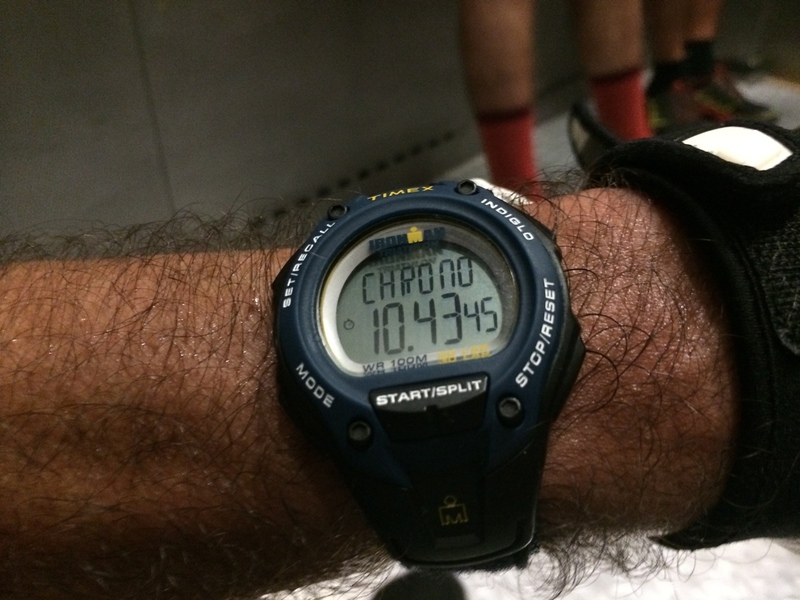 But I managed to maintain the pace, although I fell behind by a few seconds in the mid-40s. But I still had enough in the tank to be able to speed up a little bit and make up the time, and I came out on 55 with another 11:59. So that was pretty good. After doing the three climbs, I still had plenty of time for a fourth, and my reward for hitting my goal on the three was that I was going to take it easy the fourth time. I didn’t time it, and I just plodded slowly up the stairs. I stopped in front of each of the four fans that blow cool air into the stairwell. Taking a minute to cool off at the fans was a nice treat. I guess the next step will be to do this a few more times and see if I can get to a place where the first three climbs won’t be too much of a strain. When I can get to that, I’ll try for the fourth.